The Japan Aerospace Exploration Agency (JAXA) (国立研究開発法人宇宙航空研究開発機構, Kokuritsu-kenkyū-kaihatsu-hōjin Uchū Kōkū Kenkyū Kaihatsu Kikō, literally "National Research and Development Agency on Aerospace Research and Development") is the Japanese national aerospace and space agency. Through the merger of three previously independent organizations, JAXA was formed on 1 October 2003. JAXA is responsible for research, technology development and launch of satellites into orbit, and is involved in many more advanced missions such as asteroid exploration and possible manned exploration of the Moon. Its motto is One JAXA and its corporate slogan is Explore to Realize (formerly Reaching for the skies, exploring space). JAXA Kibo, the largest module of the ISS. On 1 October 2003, three organizations were merged to form the new JAXA: Japan's Institute of Space and Astronautical Science (ISAS), the National Aerospace Laboratory of Japan (NAL), and National Space Development Agency of Japan (NASDA). JAXA was formed as an Independent Administrative Institution administered by the Ministry of Education, Culture, Sports, Science and Technology (MEXT) and the Ministry of Internal Affairs and Communications (MIC). Before the merger, ISAS was responsible for space and planetary research, while NAL was focused on aviation research. NASDA, which was founded on 1 October 1969, had developed rockets, satellites, and also built the Japanese Experiment Module. The old NASDA headquarters were located at the current site of the Tanegashima Space Center, on Tanegashima Island, 115 kilometers south of Kyūshū. NASDA also trained Japanese astronauts, who flew with the US Space Shuttles. The Basic Space Law was passed in 2008, and the jurisdictional authority of JAXA moved from MEXT to the Strategic Headquarters for Space Development (SHSD) in the Cabinet, led by the Prime Minister. In 2016, the National Space Policy Secretariat (NSPS) was set up the Cabinet. In 2012, new legislation extended JAXA's remit from peaceful purposes only to include some military space development, such as missile early warning systems. Political control of JAXA passed from MEXT to the Prime Minister's Cabinet Office through a new Space Strategy Office. Noshiro Testing Center (NTC) in Noshiro, Akita – Established in 1962. It carries out development and testing of rocket engines. Sanriku Balloon Center (SBC) – Balloons have been launched from this site since 1971. Kakuda Space Center (KSPC) in Kakuda, Miyagi – Leads the development of rocket engines. Works mainly with development of liquid fuel engines. Sagamihara Campus (ISAS) – Development of experimental equipment for rockets and satellites. Also administrative buildings. Tanegashima Space Center – currently the launch site for the H-IIA and H-IIB rockets. Tsukuba Space Center (TKSC) in Tsukuba. This is the center of Japan's space network. It is involved in research and development of satellites and rockets, and tracking and controlling of satellites. 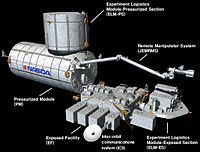 It develops experimental equipment for the Japanese Experiment Module ("Kibo"). Training of astronauts also takes place here. For International Space Station operations, the Japanese Flight Control Team is located at the Space Station Integration & Promotion Center (SSIPC) in Tsukuba. SSIPC communicates regularly with ISS crewmembers via S-band audio. Uchinoura Space Center – currently the launch site for the Epsilon rocket. JAXA uses the H-IIA (H "two" A) rocket from the former NASDA body and its variant H-IIB to launch engineering test satellites, weather satellites, etc. For science missions like X-ray astronomy, JAXA uses the Epsilon rocket. For experiments in the upper atmosphere JAXA uses the SS-520, S-520, and S-310 sounding rockets. Prior to the establishment of JAXA, ISAS had been most successful in its space program in the field of X-ray astronomy during the 1980s and 1990s. Another successful area for Japan has been Very Long Baseline Interferometry (VLBI) with the HALCA mission. Additional success was achieved with solar observation and research of the magnetosphere, among other areas. NASDA was mostly active in the field of communication satellite technology. However, since the satellite market of Japan is completely open, the first time a Japanese company won a contract for a civilian communication satellite was in 2005. Another prime focus of the NASDA body is Earth climate observation. JAXA was awarded the Space Foundation's John L. "Jack" Swigert, Jr., Award for Space Exploration in 2008. Japan launched its first satellite, Ohsumi, in 1970, using ISAS' L-4S rocket. Prior to the merger, ISAS used small solid-fueled launch vehicles, while NASDA developed larger liquid-fueled launchers. In the beginning, NASDA used licensed American models. 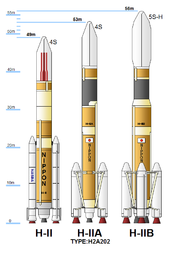 The first model of liquid-fuelled launch vehicle indigenously developed in Japan was the H-II, introduced in 1994. However, at the end of the 1990s, with two H-II launch failures, Japanese rocket technology began to face criticism. Japan's first space mission under JAXA, an H-IIA rocket launch on 29 November 2003, ended in failure due to stress problems. After a 15-month hiatus, JAXA performed a successful launch of an H-IIA rocket from Tanegashima Space Center, placing a satellite into orbit on 26 February 2005. In January 2017, JAXA attempted and failed to put a mini satellite into orbit atop one of its SS520 series rockets. A second attempt on February 2, 2018 was successful, putting a 10-pound CubeSat into Earth orbit. The rocket, known as the SS-520-5, is the world's smallest orbital launcher. On 9 May 2003, Hayabusa (meaning, Peregrine falcon), was launched from an M-V rocket. The goal of the mission was to collect samples from a small near-Earth asteroid named 25143 Itokawa. The craft rendezvoused with the asteroid in September 2005. It was confirmed that the spacecraft successfully landed on the asteroid in November 2005, after some initial confusion regarding the incoming data. Hayabusa returned to Earth with samples from the asteroid on 13 June 2010. After Hiten in 1990, ISAS planned a lunar penetrator mission called LUNAR-A but after delays due to technical problems, the project was terminated in January 2007. The seismometer penetrator design for LUNAR-A may be reused in a future mission. On 14 September 2007, JAXA succeeded in launching the lunar orbit explorer Kaguya, also known as SELENE (costing 55 billion yen including launch vehicle), the largest such mission since the Apollo program, on an H-2A rocket. Its mission is to gather data on the moon's origin and evolution. It entered lunar orbit on 4 October 2007. After 1 year and 8 months it impacted the lunar surface on 10 June 2009 at 18:25 UTC. JAXA plans to launch its first lunar surface mission, SLIM (Smart Lander for Investigating Moon) on an Epsilon rocket in fiscal year 2019. Japan's planetary missions have so far been limited to the inner Solar System, and emphasis has been put on magnetospheric and atmospheric research. The Mars explorer Nozomi (PLANET-B), which ISAS launched prior to the merger of the three aerospace institutes, became one of the earliest difficulties the newly formed JAXA faced. Nozomi ultimately passed 1,000 km from the surface of Mars. On 20 May 2010, the Venus Climate Orbiter Akatsuki (PLANET-C) and IKAROS solar sail demonstrator was launched by a H-2A launch vehicle. On 7 December 2010, Akatsuki was unable to complete its Venus orbit insertion maneuver. Akatsuki finally entered Venus orbit in 7 December 2015, making it the first Japanese spacecraft to orbit another planet, sixteen years after the originally planned orbital insertion of Nozomi. One of Akatsuki's main goal is to uncover the mechanism behind Venus atmosphere's super-rotation, a phenomenon in which the cloud top winds in the troposphere circulates around the planet faster than the speed that Venus itself rotates. A thorough explanation for this phenomenon has yet been found. JAXA/ISAS was part of the international Laplace Jupiter mission proposal from its foundation. A Japanese contribution was sought in the form of an independent orbiter to research Jupiter's magnetosphere, JMO (Jupiter Magnetospheric Orbiter). Although JMO never left the conception phase, ISAS scientists will see their instruments reaching Jupiter on the ESA-led JUICE (Jupiter Icy Moon Explorer) mission. JUICE is a reformulation of the ESA Ganymede orbiter from the Laplace project. JAXA's contribution includes providing components of the RPWI (Radio & Plasma Wave Investigation), PEP (Particle Environment Package), GALA (GAnymede Laser Altimeter) instruments. JAXA is reviewing a new spacecraft mission to the Martian system; a sample return mission to Phobos called MMX (Martian Moons Explorer). First revealed in 9 June 2015, MMX's primary goal is to determine the origin of the Martian moons. Alongside collecting samples from Phobos, MMX will perform remote sensing of Deimos, and may also observe the atmosphere of Mars as well. As of January 2016, MMX is to be launched in fiscal year 2022. On 9 August 2004, ISAS successfully deployed two prototype solar sails from a sounding rocket. A clover type sail was deployed at 122 km altitude and a fan type sail was deployed at 169 km altitude. Both sails used 7.5 micrometer thick film. ISAS tested a solar sail again as a sub payload to the Akari (ASTRO-F) mission on 22 February 2006. However the solar sail did not deploy fully. ISAS tested a solar sail again as a sub payload of the SOLAR-B launch at 23 September 2006, but contact with the probe was lost. The IKAROS solar sail was launched on 21 May 2010. The solar sail deployed successfully. The goal is to have a solar sail mission to Jupiter after 2020. The first Japanese astronomy mission was x-ray satellite Hakucho (Corsa-B), which was launched in 1979. Later ISAS moved into solar observation, radio astronomy through Space VLBI and infrared astronomy. Active missions are SOLAR-B, MAXI, SPRINT-A, and CALET. Missions under development are XRISM. Retired missions are ASTRO-F, ASTRO-EII, and ASTRO-H. ASTRO-G is a cancelled mission. Japan's first infrared astronomy mission was the 15 cm IRTS telescope which was part of the SFU multipurpose satellite in 1995. IRTS scanned during its one-month lifetime around 7% of the sky before SFU got brought back to Earth by the Space Shuttle. During the 1990s JAXA also gave ground support for the ESA Infrared Space Observatory (ISO) infrared mission. JAXA is also doing further R&D for increasing the performance of its mechanical coolers for its future infrared mission, SPICA. This would enable a warm launch without liquid helium. SPICA has the same size as the ESA Herschel Space Observatory mission, but is planned to have a temperature of just 4.5 K and will be much colder. Unlike Akari, which had a geocentric orbit, SPICA will be located at Sun–Earth L2. The launch is expected in 2027 or 2028 on JAXA's new H3 Launch Vehicle, however the mission is not yet fully funded. ESA and NASA may also each contribute an instrument. Starting from 1979 with Hakucho (CORSA-b), for nearly two decades Japan had achieved continuous observation with its Hinotori, Tenma, Ginga and ASCA (ASTRO-A through D) x-ray observation satellites. 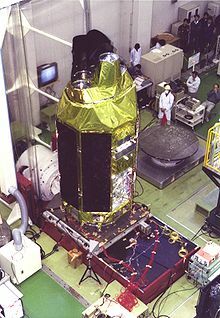 However, in the year 2000 the launch of Japan's fifth x-ray observation satellite, ASTRO-E failed (as it failed at launch it never received a proper name). Then on 10 July 2005, JAXA was finally able to launch a new X-ray astronomy mission named Suzaku (ASTRO-EII). This launch was important for JAXA, because in the five years since the launch failure of the original ASTRO-E satellite, Japan was without an x-ray telescope. Three instruments were included in this satellite: an X-ray spectrometer (XRS), an X-ray imaging spectrometer (XIS), and a hard X-ray detector (HXD). However, the XRS was rendered inoperable due to a malfunction which caused the satellite to lose its supply of liquid helium. The next JAXA x-ray mission is the Monitor of All-sky X-ray Image (MAXI). MAXI continuously monitors astronomical X-ray objects over a broad energy band (0.5 to 30 keV). MAXI is installed on the Japanese external module of the ISS. On 17 February 2016, Hitomi (ASTRO-H) was launched as the successor to Suzaku, which completed its mission a year before. Japan's solar astronomy started in the early 80s with the launch of the Hinotori (ASTRO-A) x-ray mission. The Hinode (SOLAR-B) spacecraft, the follow-on to the joint Japan/US/UK Yohkoh (SOLAR-A) spacecraft, was launched on 23 September 2006. A SOLAR-C can be expected sometime after 2020. However no details are worked out yet other than it will not be launched with the former ISAS's Mu rockets. Instead a H-2A from Tanegashima could launch it. As H-2A is more powerful, SOLAR-C could either be heavier or be stationed at L1 (Lagrange point 1). In 1998 Japan launched the HALCA (MUSES-B) Mission, the world's first spacecraft dedicated to conduct SPACE VLBI observations of pulsars, among others. To do so, ISAS set up a ground network around the world through international cooperation. The observation part of the mission lasted until 2003 and the satellite was retired at the end of 2005. In FY 2006 Japan funded the ASTRO-G as the succeeding mission. One of the primary duties of the former NASDA body was the testing of new space technologies, mostly in the field of communication. The first test satellite was ETS-I, launched in 1975. However, during the 1990s NASDA was hit by bad luck with the problems surrounding the ETS-VI and COMETS missions. In February 2018, JAXA announced a research collaboration with Sony to test a laser communication system from the Kibo module in late 2018. Testing of communication technologies remains to be one of JAXA's key duties in cooperation with NICT. To upgrade Japan's communication technology the Japanese state launched the i-Space initiative with the ETS-VIII and WINDS missions. ETS-VIII was launched on 18 December 2006. The purpose of ETS-VIII is to test communication equipment with two very large antennas and an atomic clock test. On 26 December both antennas were successfully deployed. This didn't come unexpected, since JAXA tested the deployment mechanism before with the LDREX-2 Mission, which was launched on 14 October with the European Ariane 5. The test was successful. The mission of WINDS (Kizuna) is to create the worlds fastest satellite internet connection. WINDS was launched in February 2008. On 24 August 2005, JAXA launched the experimental satellites OICETS and INDEX on a Ukrainian Dnepr rocket. OICETS (Kirari) is a mission tasked with tesing optical links with the European Space Agency (ESA) ARTEMIS satellite, which is around 40,000 km away from OICETS. The experiment was successful on 9 December, when the link could be established. In March 2006 JAXA could establish with OICETS the worldwide first optical links between a LEO satellite and a ground station first in Japan and in June 2006 with a mobile station in Germany. INDEX (Reimei) is a small 70 kg satellite for testing various equipment, and functions as an aurora observation mission as well. The Reimei satellite is currently in its extended mission phase. Japan's first Earth observation satellites were MOS-1a and MOS-1b launched in 1987 and 1990. During the 1990s and the new millennium this programme came under heavy fire, because both Adeos (Midori) and Adeos 2 (Midori 2) satellites failed after just 10 months in orbit. 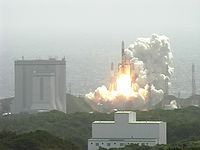 In January 2006, JAXA successfully launched the Advanced Land Observation Satellite (ALOS/Daichi). Communication between ALOS and the ground station in Japan will be done through the Kodama Data Relay Satellite, which was launched during 2002. This project is under intense pressure due to the shorter than expected lifetime of the ADEOS II (Midori) Earth Observation Mission. For missions following Daichi, JAXA opted to separate it into a radar satellite (ALOS-2) and an optical satellite (ALOS-3). ALOS 2 SAR was launched in May 2014. Since Japan is an island nation and gets struck by typhoons every year, research about the dynamics of the atmosphere is a very important issue. For this reason Japan launched in 1997 the TRMM (Tropical Rainfall Measuring Mission) satellite in cooperation with NASA, to observe the tropical rainfall seasons. For further research NASDA had launched the ADEOS and ADEOS II missions in 1996 and 2003. However, due to various reasons,[specify] both satellites had a much shorter than expected life term. On 28 February 2014, a H-2A rocket launched the GPM Core Observatory, a satellite jointly developed by JAXA and NASA. The GPM mission is the successor to the TRMM mission, which by the time of the GPM launch had been noted as highly successful. JAXA provided the Global Precipitation Measurement/Dual-frequency Precipitation Radar (GPM/DPR) Instrument for this mission. Global Precipitation Measurement itself is a satellite constellation, whilst the GPM Core Observatory provides a new calibration standard for other satellites in the constellation. Other countries/agencies like France, India, ESA etc. provides the subsatellites. The aim of GPM is to measure global rainfall with unprecedented detail. At the end of the 2008 fiscal year, JAXA launched the satellite GOSAT (Greenhouse Gas Observing SATellite) to help scientists determine and monitor the density distribution of carbon dioxide in the atmosphere. The satellite is being jointly developed by JAXA and Japan's Ministry of the Environment. JAXA is building the satellite while the Ministry is in charge of the data that will be collected. Since the number of ground-based carbon dioxide observatories cannot monitor enough of the world's atmosphere and are distributed unevenly throughout the globe, the GOSAT may be able to gather more accurate data and fill in the gaps on the globe where there are no observatories on the ground. Sensors for methane and other greenhouse gasses are also being considered for the satellite, although the plans are not yet finalized. The satellite weighs approximately 1650 kg and is expected to have a life span of 5 years. Next funded earth observation mission after GOSAT is the GCOM (Global Change Observation Mission) earth observation programme as a successor to ADEOS II (Midori) and the Aqua mission. To reduce the risk and for a longer observation time the mission will be split into smaller satellites. Altogether GCOM will be a series of six satellites. The first satellite, GCOM-W (Shizuku) was launched on 17 May 2012 with the H-IIA. The launch of the second satellite, GCOM-C is currently planned for 2017. For weather observation Japan launched in February 2005 the Multi-Functional Transport Satellite 1R (MTSAT-1R). The success of this launch was critical for Japan, since the original MTSAT-1 couldn't be put into orbit because of a launch failure with the H-2 rocket in 1999. Since then Japan relied for weather forecasting on an old satellite which was already beyond its useful life term and on American systems. On 18 February 2006, JAXA, as head of the H-IIA at this time, successfully launched the MTSAT-2 aboard a H-2A rocket. MTSAT-2 is the backup to the MTSAT-1R. 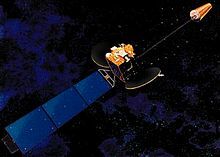 The MTSAT-2 uses the DS-2000 satellite bus developed by Mitsubishi Electric. The DS-2000 is also used for the DRTS Kodama, ETS-VIII and the Superbird 7 communication satellite, making it the first commercial success for Japan. As a secondary mission both the MTSAT-1R and MTSAT-2 help to direct air traffic. Ongoing joint missions with NASA are the Tropical Rainfall Measuring Mission (TRMM), the Aqua Earth Observation Satellite, and the Global Precipitation Measurement (GPM) Core satellite. On May 11, 2018 JAXA has launched the first outer-space object registered by Kenya. Satellite 1KUNS-PF created by University of Nairobi was launched from the Japanese module of the International Space Station. As JAXA shifted away from international efforts beginning in 2005, plans are developing for independent space missions, such as a proposed manned mission to the moon. On 23 February 2008 JAXA launched the Wideband InterNetworking engineering test and Demonstration Satellite (WINDS), also called "KIZUNA." WINDS will facilitate experiments with faster internet connections. The launch, using H-IIA launch vehicle 14, took place from the Tanegashima Space Center. On 10 September 2009 the first H-IIB rocket was successfully launched, delivering the HTV-1 freighter to resupply the International Space Station. In the year 2009 JAXA plans to launch the first satellite of the Quasi Zenith Satellite System (QZSS), a subsystem of the global positioning system (GPS). Two others are expected to follow later. If successful, one satellite will be in a zenith position over Japan full-time. The QZSS mission is the last scheduled major independent mission for JAXA, as no major civilian projects were funded after that for now. The only exception is the IGS programme which will be continued beyond 2008. However it seems Japan is pressing forward now with the GCOM earth observation satellites as successors to the ADEOS missions. First launch is planned for 2010. In 2009 Japan also plans to launch a new version of the IGS with an improved resolution of 60 cm. For the 2018 ESA EarthCARE mission, JAXA will provide the radar system on the satellite. JAXA is also providing the Light Particle Telescope (LPT) for the 2008 Jason 2 satellite by the French CNES. JAXA will provide the Auroral Electron Sensor (AES) for the Taiwanese FORMOSAT-5. XEUS joint X-Ray telescope with ESA, launch after 2015. Planning interplanetary research missions can take up to seven years, such as the ASTRO-E. Due to the lag time between these interplanetary events and mission planning time, opportunities to gain new knowledge about the cosmos might be lost. To prevent this, JAXA plans on using smaller, faster missions from 2010 onwards. JAXA is developing a new solid-fueled rocket, the Epsilon, to replace the retired M-V.
IKAROS (Interplanetary Kite-craft Accelerated by Radiation Of the Sun), a small size powered-solar sail experimental spacecraft. Future mission will use solar sail for Jupiter and Trojan asteroids exploration. Nano-JASMINE - Small-JASMINE - JASMINE, a series of astrometric telescopes similar to the Gaia mission but operating in the infra-red (2.2 µm) and specifically targeting the Galactic plane and centre, where Gaia's results are impaired by dust absorption. Japan has ten astronauts but has not yet developed its own manned spacecraft and is not currently developing one officially. A potentially manned space shuttle-spaceplane HOPE-X project launched by the conventional space launcher H-II was developed for several years (including test flights of HYFLEX/OREX prototypes) but was postponed. The simpler manned capsule Fuji was proposed but not adopted. Projects for single-stage to orbit, horizontal takeoff reusable launch vehicle and landing ASSTS and the vertical takeoff and landing Kankoh-maru also exist but have not been adopted. The first Japanese citizen to fly in space was Toyohiro Akiyama, a journalist sponsored by TBS, who flew on the Soviet Soyuz TM-11 in December 1990. He spent more than seven days in space on the Mir space station, in what the Soviets called their first commercial spaceflight which allowed them to earn $14 million. Japan participates in US and international manned space programs including flights of Japanese astronauts on Russian Soyuz spacecraft to the ISS. One Space Shuttle mission (STS-47) in September 1992 was partially funded by Japan. This flight included JAXA's first astronaut in space, Mamoru Mohri, as the Payload Specialist for the Spacelab-J, one of the European built Spacelab modules. This mission was also designated Japan. A view of the completed Kibo module. Three other NASA Space Shuttle missions (STS-123, STS-124, STS-127) in 2008–2009 delivered parts of the Japanese built spacelab-module Kibo to ISS. Japanese plans for a manned lunar landing were in development but were shelved in early 2010 due to budget constraints. In June 2014 Japan's science and technology ministry said it was considering a space mission to Mars. In a ministry paper it indicated unmanned exploration, manned missions to Mars and long-term settlement on the Moon were objectives, for which international cooperation and support was going to be sought. On October 18th, 2017, Japanese discovery of a "tunnel" under the surface of the moon has led to press-release. The tunnel seems to be suitable as a location for a base-of-operations of peaceful manned space missions, according to JAXA. Besides the H-IIA/B and Epsilon rockets, JAXA is also developing technology for a next-generation supersonic transport that could become the commercial replacement for the Concorde. The design goal of the project (working name Next Generation Supersonic Transport) is to develop a jet that can carry 300 passengers at Mach 2. A subscale model of the jet underwent aerodynamic testing in September and October 2005 in Australia. In 2015 JAXA performed tests aimed at reducing the effects of super sonic flight under the D-SEND program. The economic success of such a project is still unclear, and as a consequence the project has been met with limited interest from Japanese aerospace companies like Mitsubishi Heavy Industries so far. Until 2003, JAXA (ISAS) conducted research on a reusable launch vehicle under the Reusable Vehicle Testing (RVT) project. Not included into the JAXA organization is the Japan Space Systems (J-spacesystems), Japan's other space agency. Wikimedia Commons has media related to JAXA. ^ McCurry, Justin (15 September 2007). "Japan launches biggest moon mission since Apollo landings". guardian.co.uk/science. London. Retrieved 16 September 2007. ^ "JAXA - Keiji Tachikawa - JAXA in 2006 -". Retrieved 12 June 2015. ^ "JAXA - New JAXA Philosophy and Corporate Slogan". Retrieved 12 June 2015. ^ "Law Concerning Japan Aerospace Exploration Agency" (PDF). JAXA. Retrieved 20 April 2010. ^ Kamiya, Setsuko, "Japan a low-key player in space race Archived 3 August 2009 at the Wayback Machine", Japan Times, 30 June 2009, p. 3. ^ An overview of Japan’s space activities, 14 August 2018. ^ "Japan Passes Law Permitting Military Space Development". Defense News. 22 June 2012. Retrieved 29 October 2012. ^ "ISS On-Orbit Status 04/23/09". NASA. ^ Shim, Elizabeth (25 November 2015). "Japan launches first commercial satellite". ^ Kyodo (15 January 2017). "JAXA fails in bid to launch world's smallest satellite-carrying rocket". The Japan Times. Retrieved 16 January 2017. ^ "Souped-up sounding rocket lifts off from Japan with tiny satellite". Spaceflight Now. 2 February 2018. Retrieved 7 February 2018. ^ "JCN Newswire - Asia Press Release Distribution". ^ "Japan launches first lunar probe". BBC NEWS. 14 September 2007. ^ "Japan delays launch of unmanned lunar lander to second half of fiscal 2019". The Japan Times. 4 June 2015. Retrieved 22 June 2015. ^ "JAXA plans probe to bring back samples from moons of Mars". 10 June 2015. Retrieved 31 August 2018 – via Japan Times Online. ^ "ISASニュース 2016.1 No.418" (PDF) (in Japanese). Institute of Space and Astronautical Science. 22 January 2016. Retrieved 4 February 2016. ^ Torishima, Shinya (19 June 2015). "JAXAの「火星の衛星からのサンプル・リターン」計画とは". Mynavi News (in Japanese). Retrieved 6 October 2015. ^ "高時間分解能観測がひらく火星ダスト・水循環の科学" (PDF) (in Japanese). Center for Planetary Science. 28 August 2015. Retrieved 4 February 2016. ^ "JAXA、火星衛星「フォボス」探査…２２年に". The Yomiuri Shimbun (in Japanese). 4 January 2016. Archived from the original on 4 January 2016. Retrieved 4 February 2016. ^ "JAXA - Takao Nakagawa - Dramatic Birth and Death of Stars -". Retrieved 12 June 2015. ^ JAXA. "MAXI:Experiment - International Space Station - JAXA". Archived from the original on 21 May 2013. Retrieved 12 June 2015. ^ "National Astronomical Observatory of Japan (NAOJ)". Archived from the original on 22 March 2012. Retrieved 12 July 2015. ^ "SSL Redirect... please wait". Retrieved 12 June 2015. ^ "JAXA | Laser Link Communications Technology and Kibo Cooperative Research Agreement by JAXA, Sony CSL and Sony". JAXA | Japan Aerospace Exploration Agency. Retrieved 21 April 2018. ^ "製品のご紹介製品・衛星プラットフォーム／DS2000" (in Japanese). Mitsubishi Electric. Archived from the original on 22 August 2008. Retrieved 3 August 2008. ^ "Kenya's first satellite is now in Earth orbit". Retrieved 31 August 2018. ^ "Launch Result of the KIZUNA (WINDS) by the H-IIA Launch Vehicle No. 14 (H-IIA F14)". JAXA. ^ "Japan's space freighter in orbit". Jonathan Amos. BBC. 10 August 2009. Retrieved 10 September 2009. ^ a b c d e f g h i j "宇宙開発戦略本部決定 宇宙基本計画工程表(平成27年度改訂)" (PDF) (in Japanese). 宇宙開発戦略本部. 12 December 2015. Retrieved 2 February 2016. ^ Hirahara, Masafumi (12 July 2012). "Plasma/particle instruments and Japan-Taiwan collaboration for the Geospace magnetosphere/ionosphere" (PDF). Archived from the original (PDF) on 12 July 2012. Retrieved 30 April 2018. ^ "軟Ｘ線から硬Ｘ線の広帯域を高感度で撮像分光する小型衛星計画" (PDF) (in Japanese). JAXA. 1 January 2016. Retrieved 4 April 2016. ^ "Japan eyes solar station in space as new energy source". Physorg.com. 8 November 2009. Retrieved 24 March 2010. ^ "Japanese hope to build on Mars". The Tokyo News.Net. Archived from the original on 2 June 2014. Retrieved 2 June 2014. There are 102 institutions as of April 1, 2012. Bold institutions employ national public servants. This page was last edited on 19 March 2019, at 13:37 (UTC).